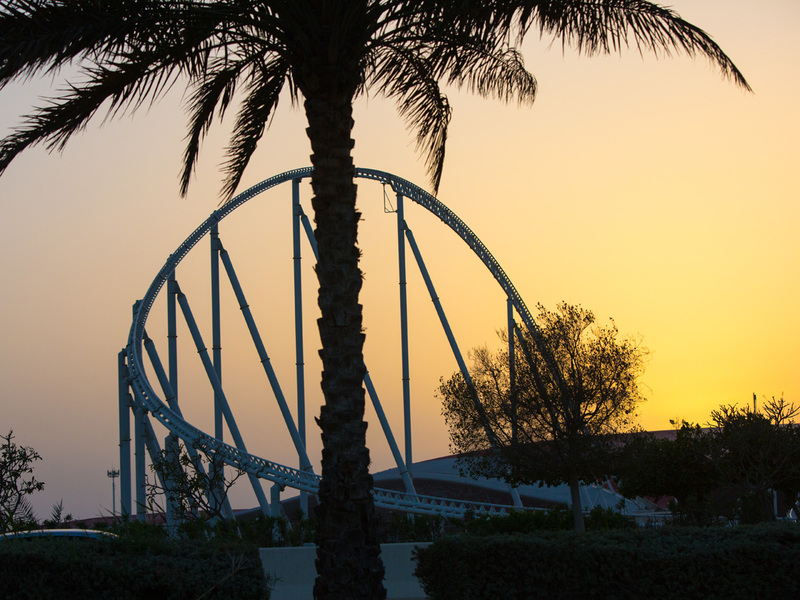 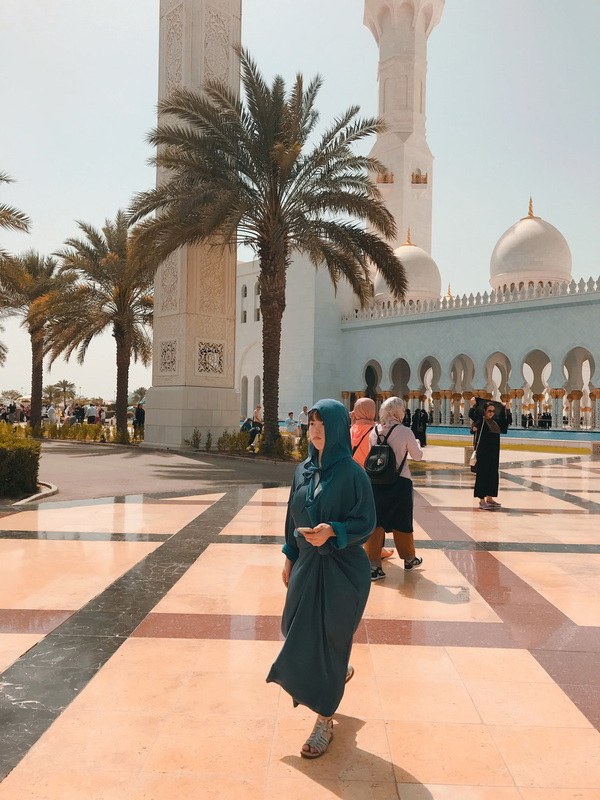 Abu Dhabi – which is the capital of the United Arab Emirates – is just 130 km away from Dubai and nothing short of spectacular. 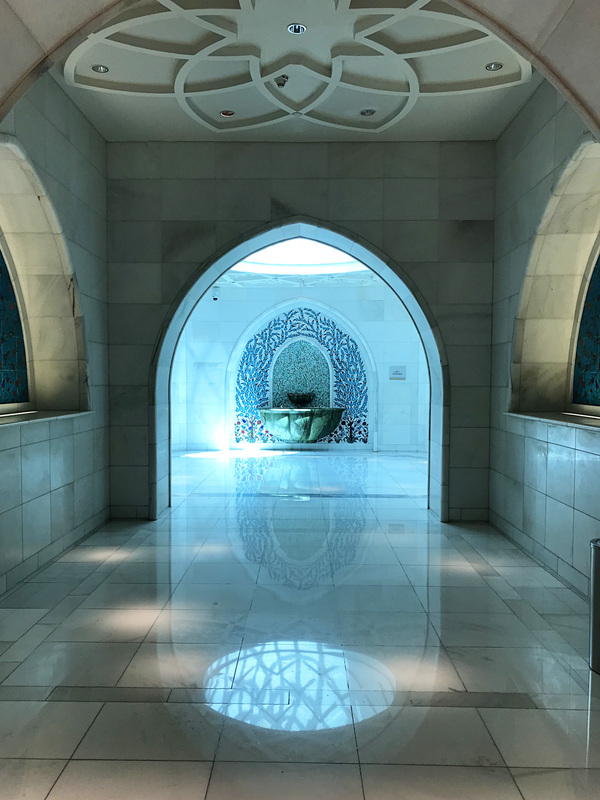 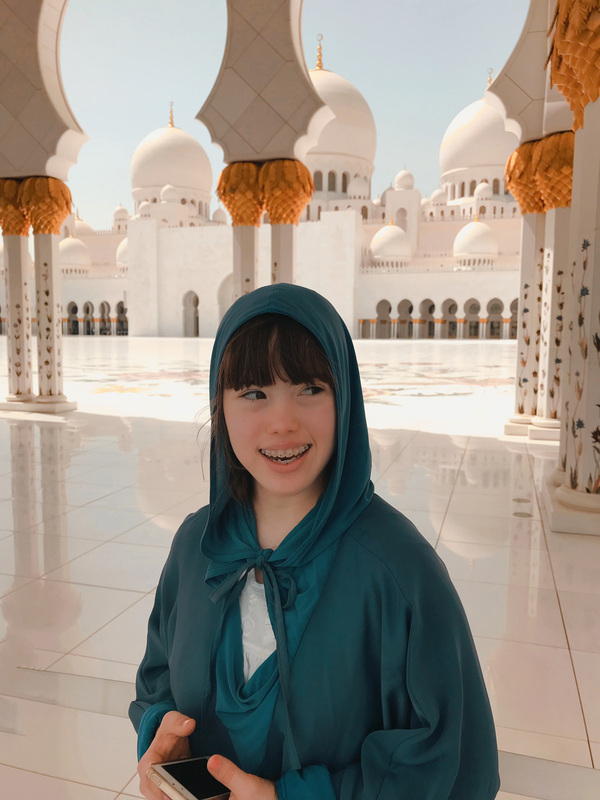 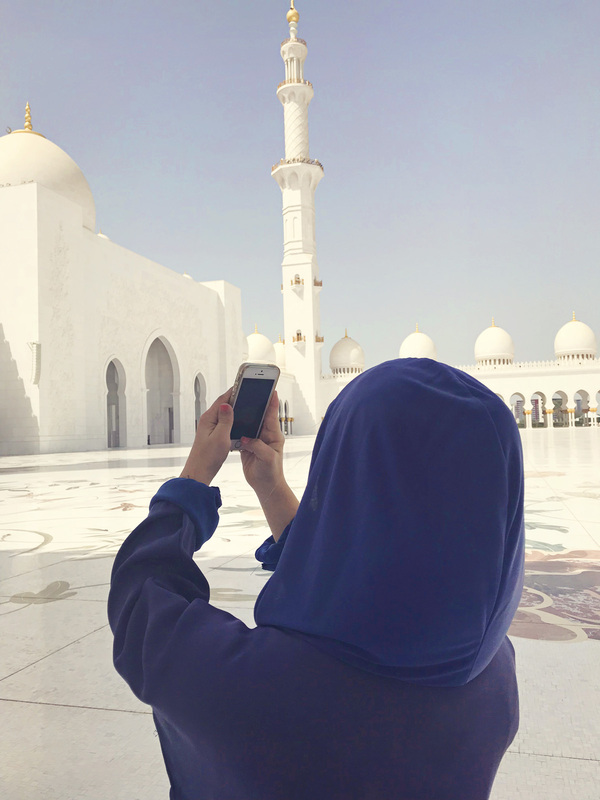 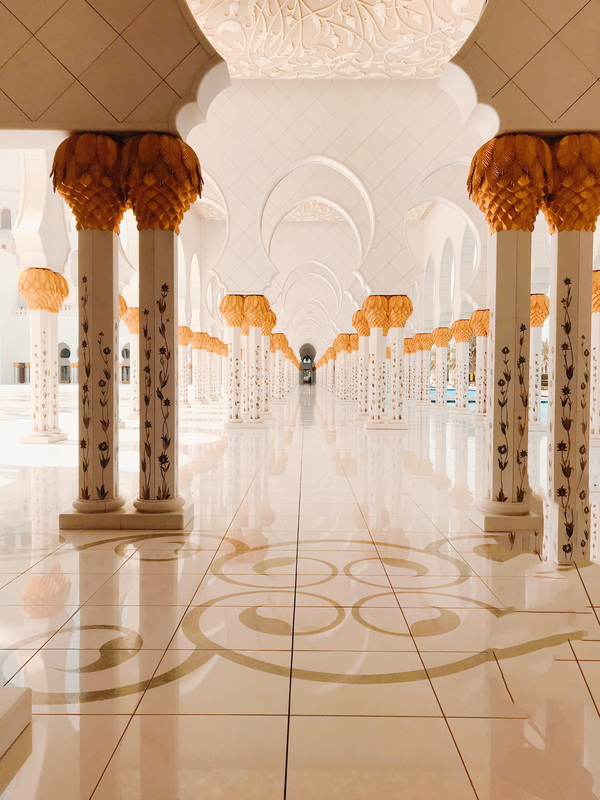 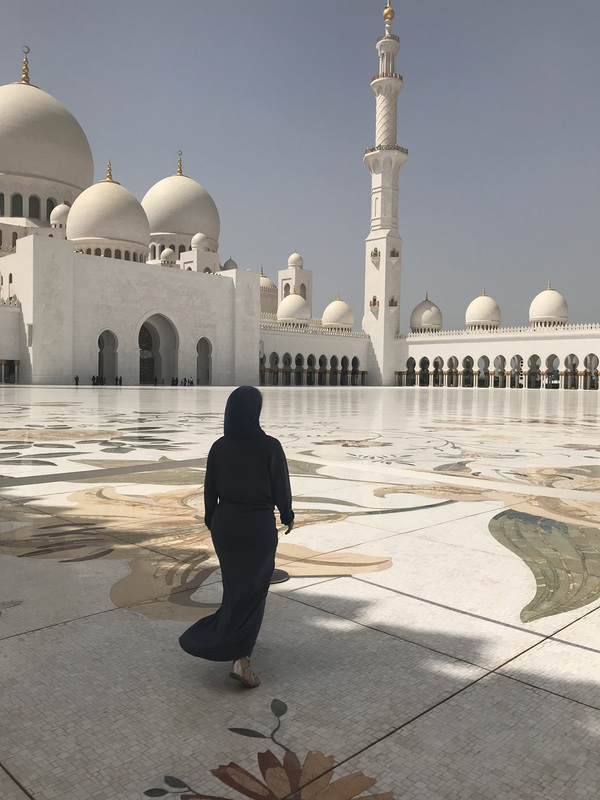 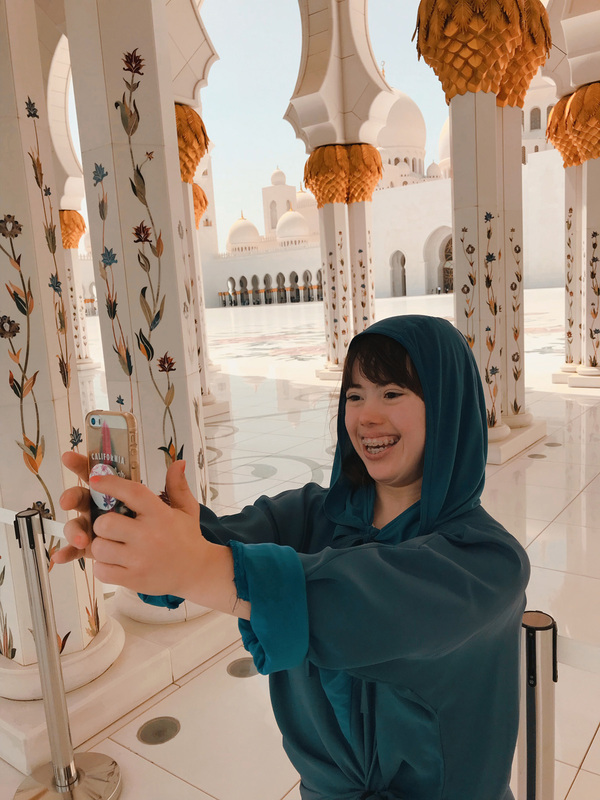 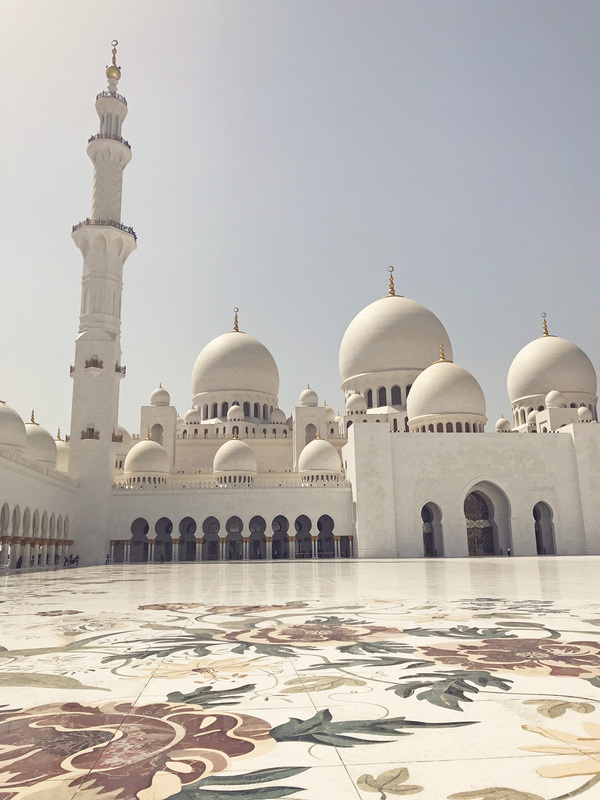 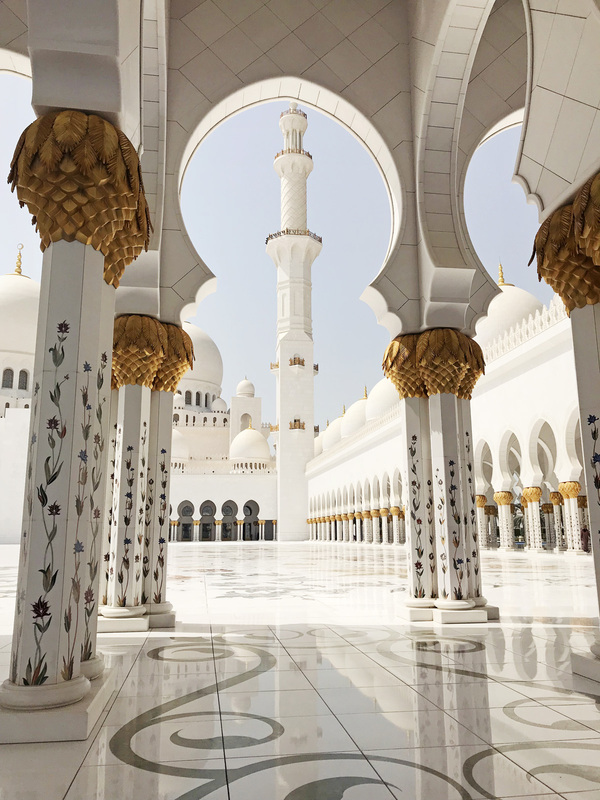 Our first stop was at Abu Dhabi’s star attraction: the Sheik Zayed Grand Mosque, which is such a phenomenal work of art and architecture and definitely lives up to its name. 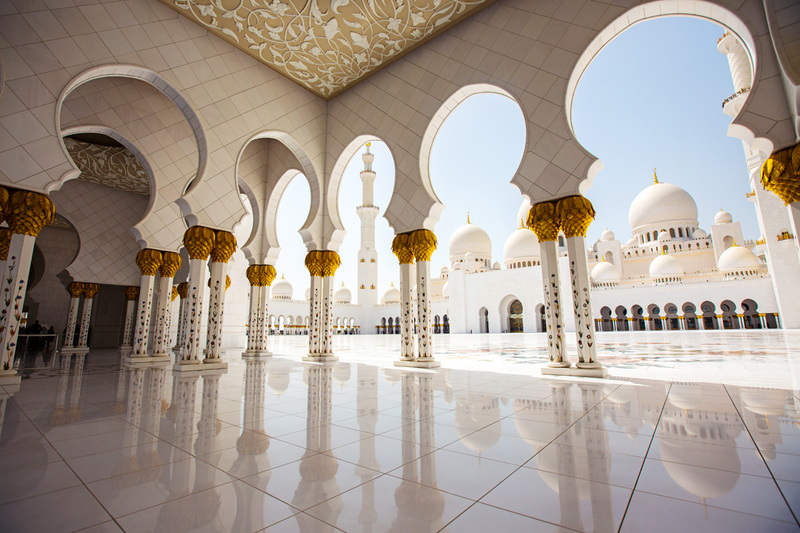 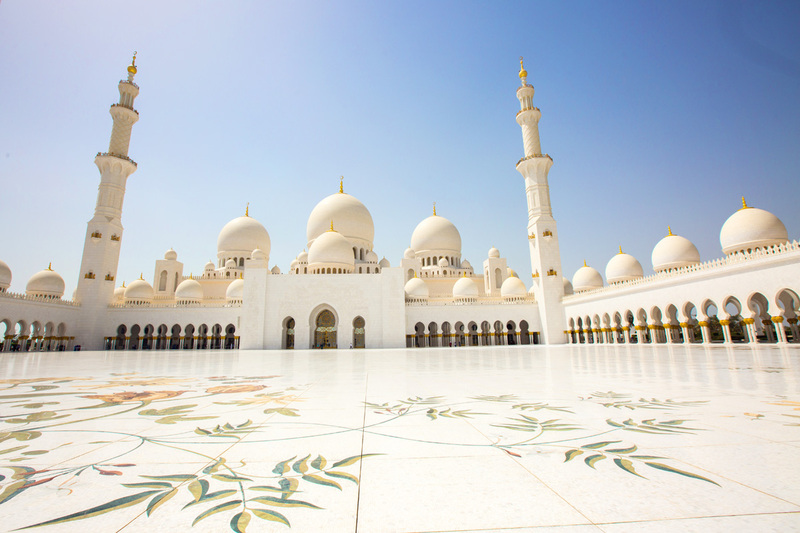 This spell-binding mosque is the largest place of worship in the UAE. 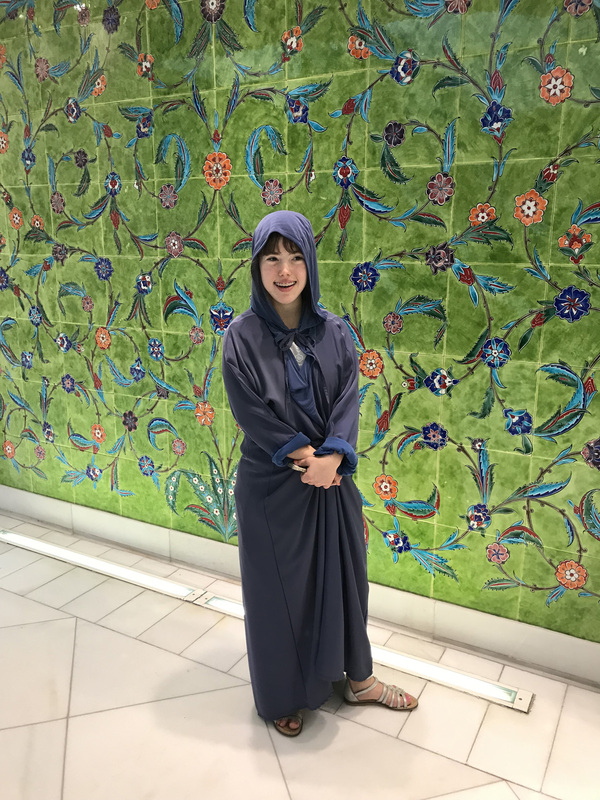 Women are required to dress respectably to visit the mosque, so Juliana and I were wearing a full-length Abaya with hood. 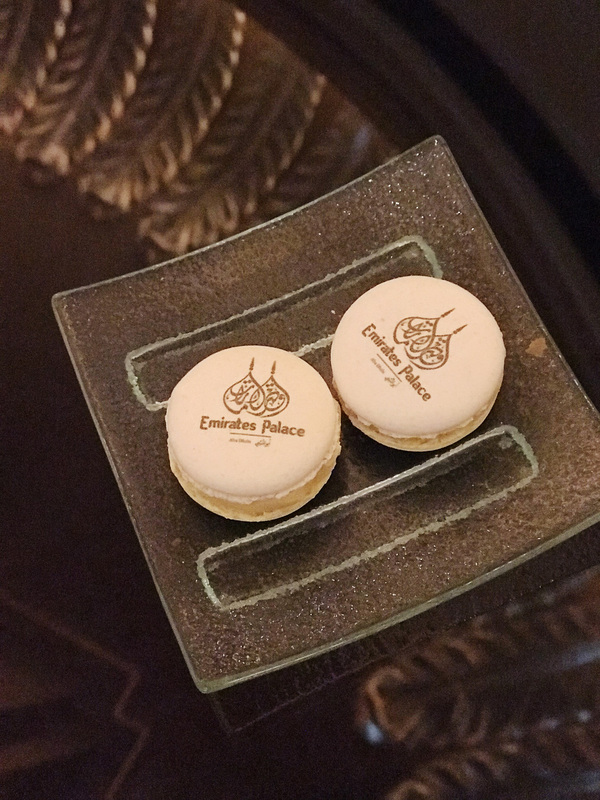 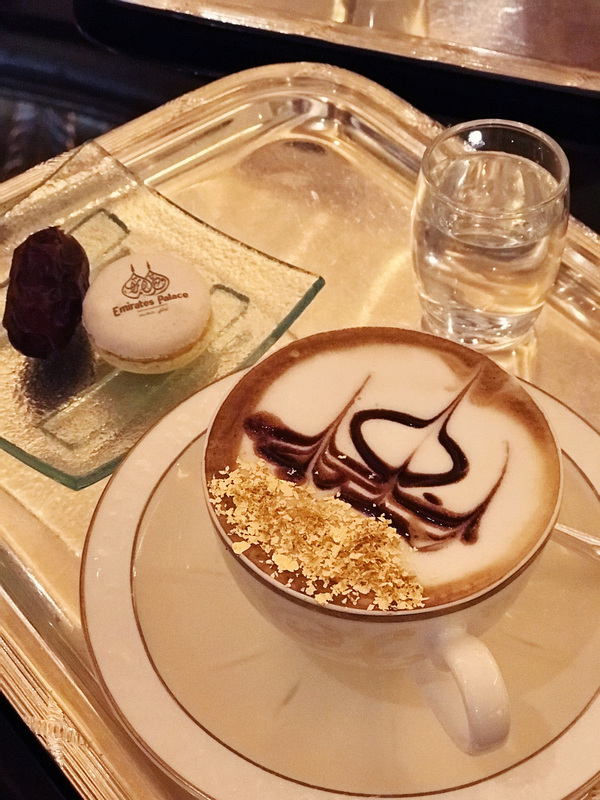 After our visit of the most beautiful mosque of the world we craved some coffee and something sweet. 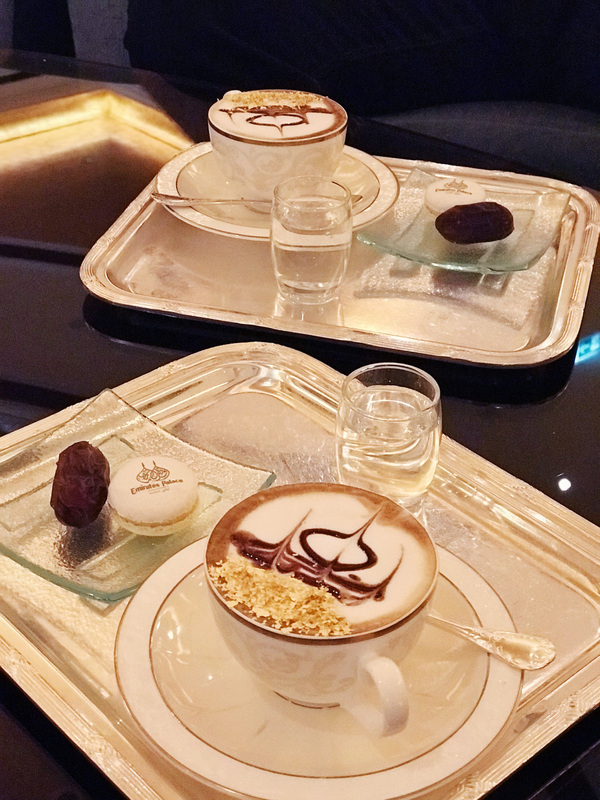 The cappuccino addict that I am I already knew about the Emirates Palace’s signature elixir and gastronomic delight and it was high on my coffee loving bucket list: the famous Palace Cappuccino, a rich coffee sprinkled with real 24-karat goldflakes. 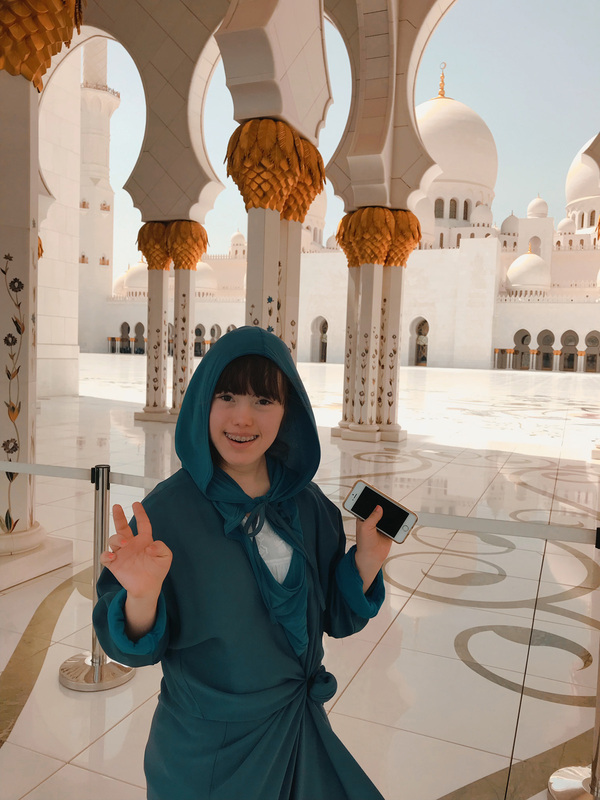 I am not kidding you! 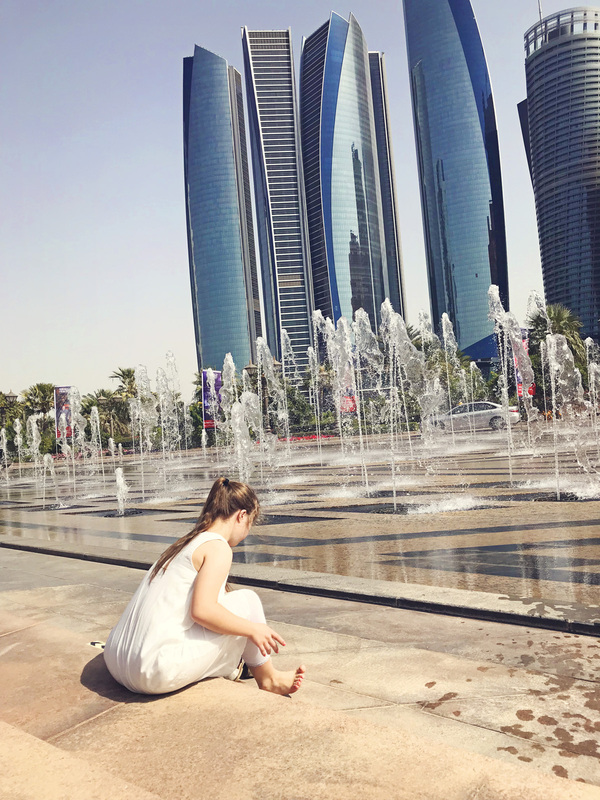 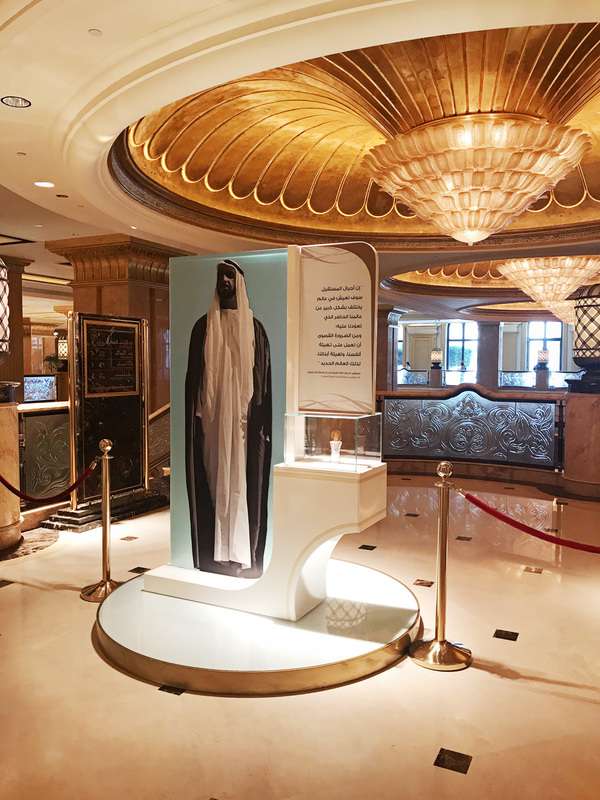 At the entrance of the Moroccan style hotel with its bronze appearance, you have a wonderful view of the famous Etihad Towers (the Fast and Furious fans among you recognize them from the seventh movie) and the adjacent luxury hotel Bab Al Qasr. 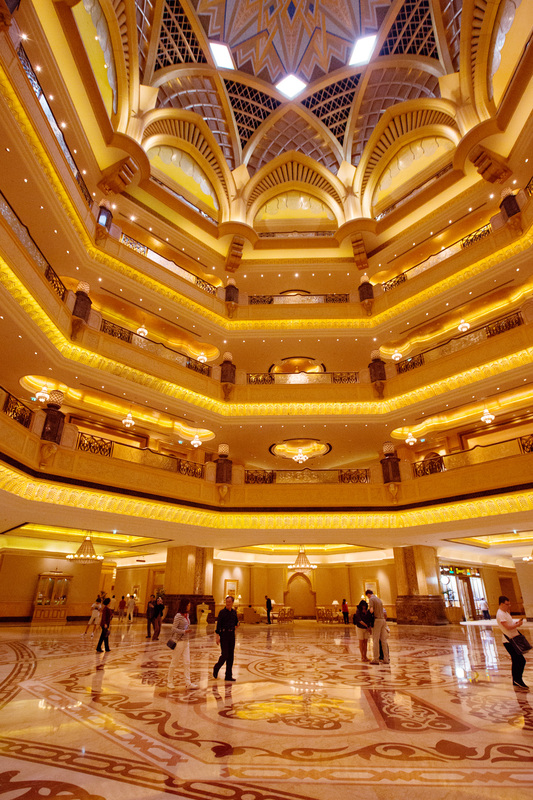 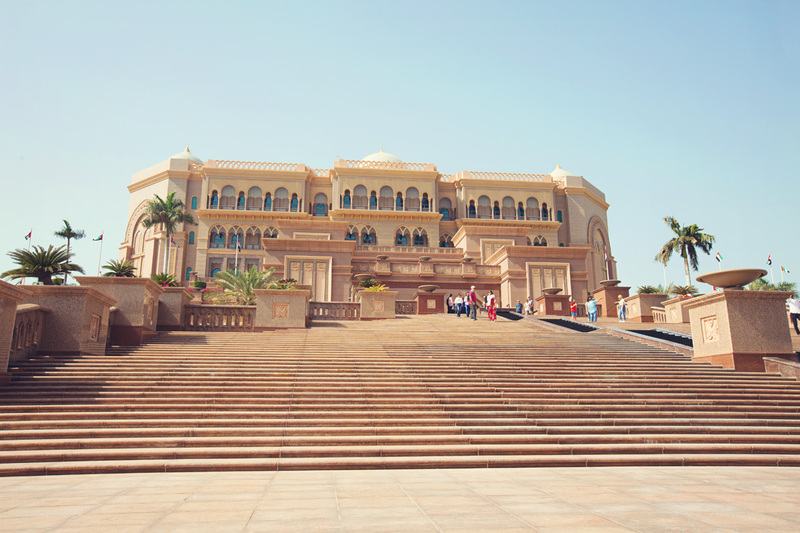 The Emirates Palace is both a palace and a five-star-hotel, but also often called a seven-star-hotel. 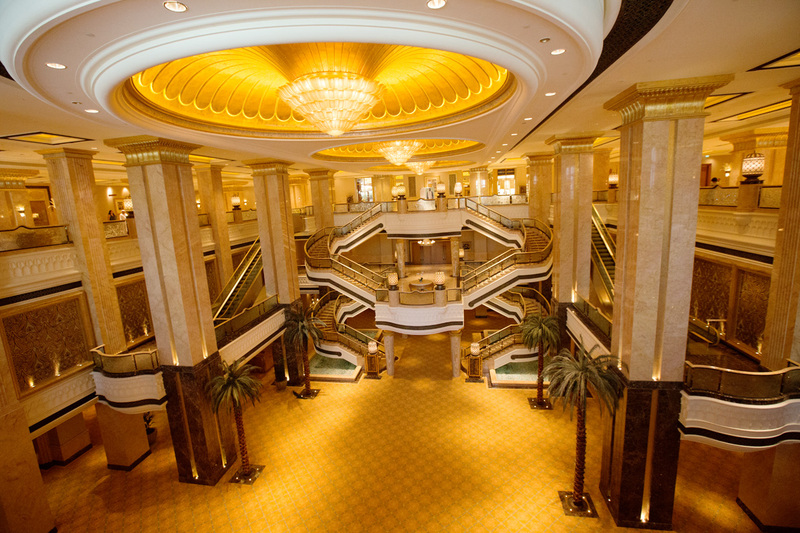 This ultra-luxurious iconic landmark has more than 300 rooms and a 1,300 m private beach and marina of its own. 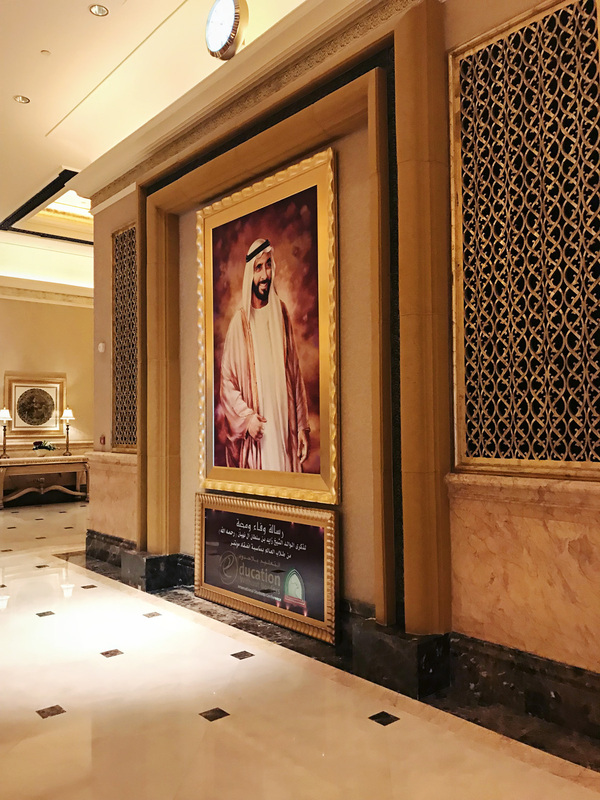 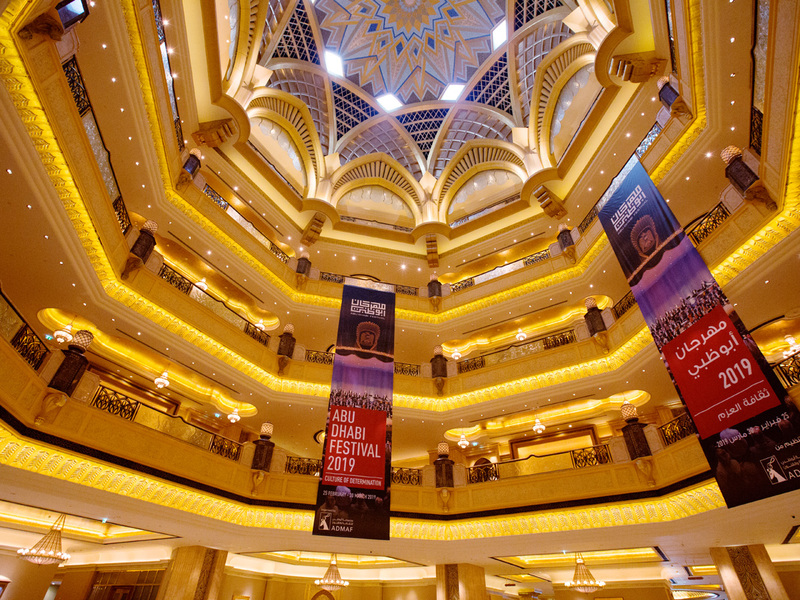 Just wandering around the hotel and looking at all the artworks on its golden and marble walls and lovely Swarovski chandeliers is such a visual treat for the eyes. 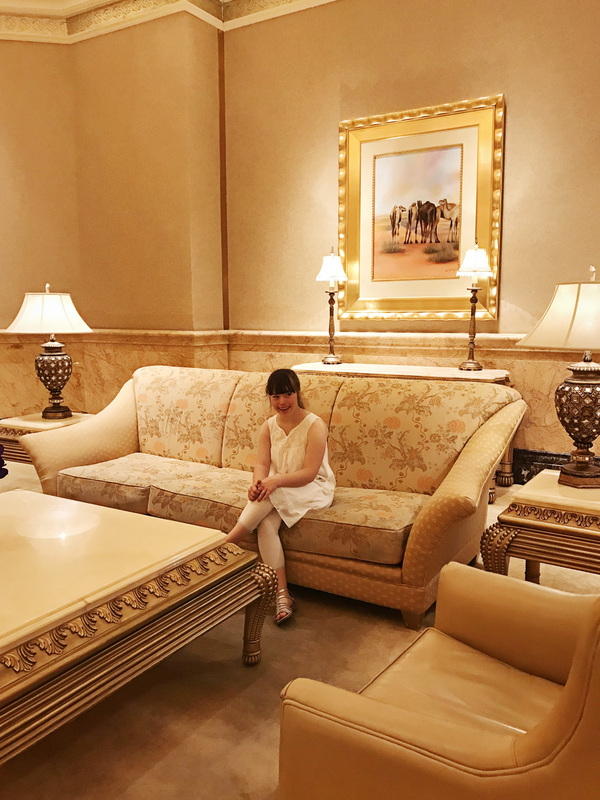 Juliana enjoyed relaxing on one of those comfy couches and really indulged in this royal feeling. 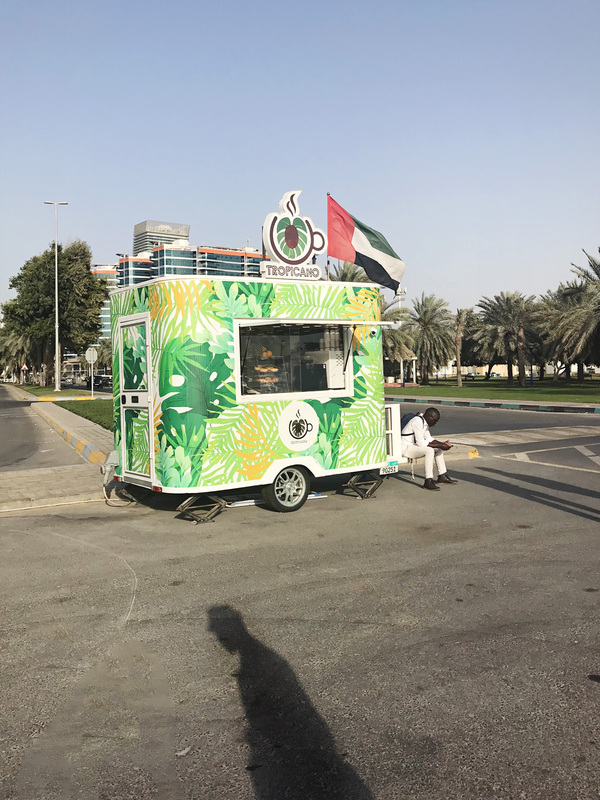 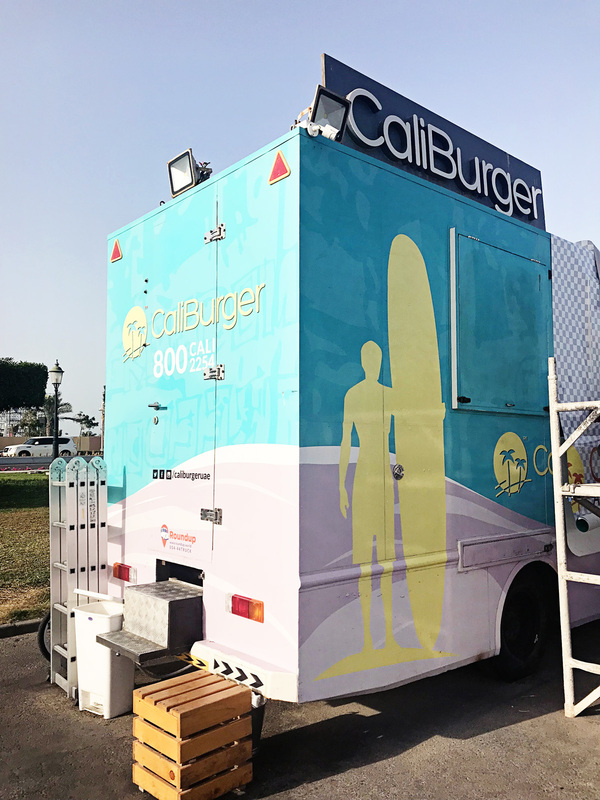 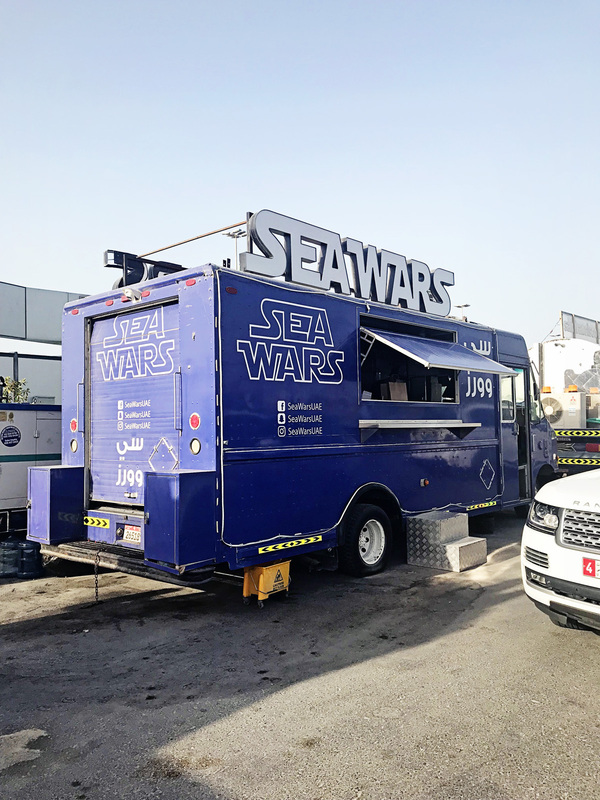 On our way to the beach at the Corniche Road we stumbled upon these amazing food trucks which are real elusive gourmet mobile kitchens. 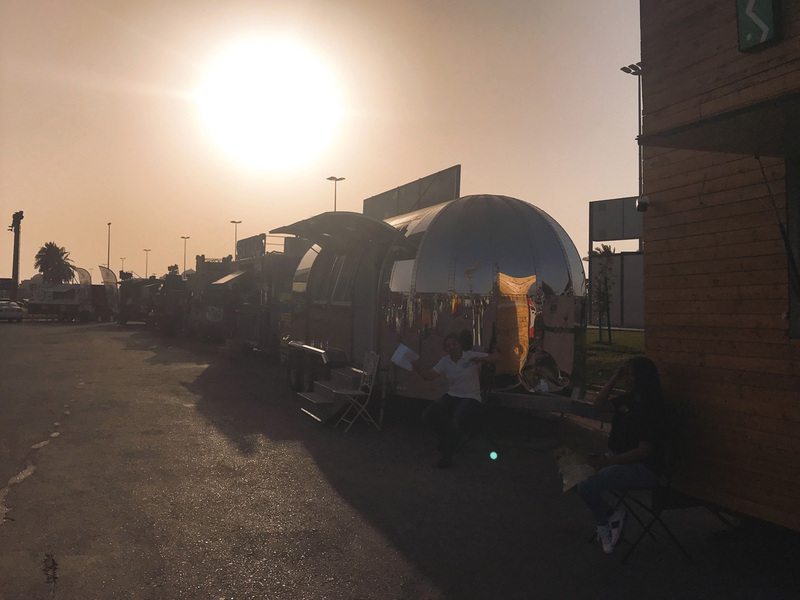 From burgers to smoothies, everyone of us found something to their liking.